Home » How To Wack » Join Now! Join Wacktrap, right now. We make it easy-and free. There's no better time to Join Wacktrap. A wack world awaits, with features you won't see until you're a registered member. Becoming a Wacktrap member is free and-we've made sure-simple. Wacktrap values your privacy. We'll only ask you for a couple of basics, to get you started right away. Don't worry, we won't weigh you down with tons of information requests and don't care about the name of your firstborn. You'll be able to add your own wack, the moment you're registered. Click this link to Join Wacktrap now or, if you're not done readin', just click the blue 'Join Wacktrap' tab in the top navigation bar of any page. 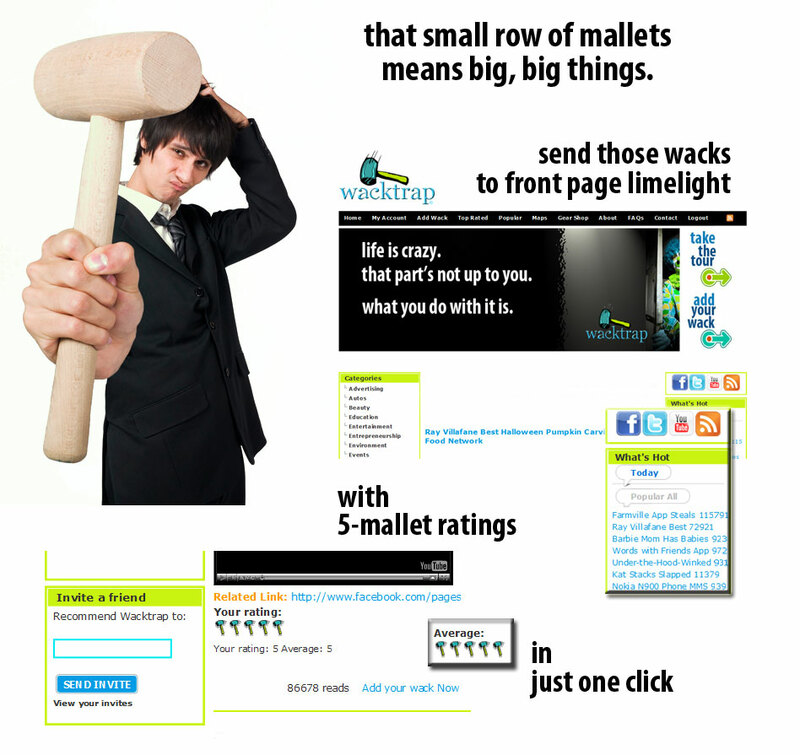 What you see on Wacktrap is what you get, and that’s changin' only for the better. We know you’re going to like Wacktrap so much, you may never want to log off. Of course that means you won’t be needing a trial membership. The Wacktrap Account you'll be setting up and experiencing now is free. And it's stayin' that way. Wacktrap takes all the outrageous, wack things in life and snares ‘em in one place. A wack ranges from the lame to the seemingly unbelievable or even absurd. And, sometimes, the straight-up outrageous. Wacks occur daily, in every industry and type of business. Crazy experiences happen. You may have a wack experience related to a retail store, credit card company, bank or service, or your wack may as easily be related to your HOA, contractor, attorney, or doctor. And we're not leavin' out those really crucial wacks: the personal wacks, that hit close to home. Another driver on the road, co-workers, friends (or possibly former ones), spouses, lovers, and of course family. To add a wack, you've gotta have a username and password. Your username and password stay with you for the long-term, so choose one you won’t forget. Don’t worry, we'll send 'em to you if you do. But if you’re forgettin’ so soon, no one else is rememberin' either. We'll wait for you here while you read some quick tips on choosing a Wacktrap username. When your wack's promoted to the front page, that name of yours is goin' round the world. That claim to fame is yours, so make your name a fantastic-and memorable-one! That surname of yours is mighty important to sites that depend on it. Sites like Facebook and Twitter need it, to fulfill their purposes. We'll help you send those best wacks to your Facebook profile and tweet those wacks using Twitter. At Wacktrap we’re helpin’ you connect-in a different and very powerful way. So while that offline name you’ve been using all these years will continue to be handy for regular stuff, you won’t be needing it here. You’ll be adding your new Wacktrap username to that arsenal of yours-and we think you’ll find it a mighty powerful tool indeed.